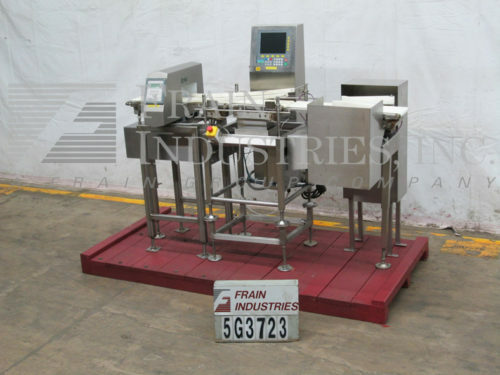 Checkweigher and metal detector combination systems include both a checkweigher to check the weight of a package or product and a metal detector to detect the presence of metal within a package or container. Checkweigher and metal detector combination units provide quality assurance checks that the product or package is within allowable tolerance for the weight of the product and that the product or package does not contain metal pieces that could harm a future customer. 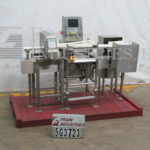 Checkweigher and metal detector combination units are often designed with a common reject system for both packages of unacceptable weights and for packages that contain metal pieces. Combination CEIA Model THS/SL metal detector / Delford Model G1000-02 Sortaweigh checkweigher with number of product per minute – depending on materials and application. Equipped with (3) white neoprene conveyor belts, 34-1/2" long x 6-3/4" wide, in feed 17" long x 7-3/4" wide weigh belt with accuracies to 0.5gram and 33" long x 7-3/4" wide discharge conveyor. Control panel has touchpad controller with readout. Mounted on (4) leg base frame. Metal detector with 9" wide x 4-1/4" high useable aperture, product guide rails, dual pneumatic reject arms and product reject bin. ferrous, non-ferrus and stainless steel sensesity detection depending on materials application and enviroment being run in. Control panel has touchpad controls with read out and e-stop. Both have adjustable in feed / discharge heights. Mounted on (4) leg stainless steel frames.